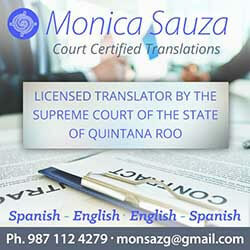 Monica Sauza is licensed by the Supreme Court of the State of Quintana Roo, Mexico (O.M. 043/98). Monica has provided consulting services, interpreting & translating documents and has assisted foreigners and Island residents to establish residence and businesses. She’s been an Expert Translator appointed by the State Supreme Court since 1997. Making sure that the content in either language is not lost nor changed. Legal documents are duly certified.